The Pythonidae, commonly known simply as pythons, from the Greek word python (πυθων), are a family of nonvenomous snakes found in Africa, Asia, and Australia. Among its members are some of the largest snakes in the world. Eight genera and 31 species are currently recognized. Pythons are found in sub-Saharan Africa, Nepal, India, Sri Lanka, Burma, southern China, Ryukyu Islands in southern Japan, Southeast Asia, and from the Philippines southeast through Indonesia to New Guinea and Australia. In the United States, an introduced population of Burmese pythons, Python molurus bivittatus, has existed as an invasive species in the Everglades National Park since the late 1990s. Many species have been hunted aggressively, which has greatly reduced the population of some, such as the Indian python, Python molurus. Most members of this family are ambush predators, in that they typically remain motionless in a camouflaged position, and then strike suddenly at passing prey. Attacks on humans, although known to occur, are extremely rare. Pythons use their sharp, backward-curving teeth, four rows in the upper jaw, two in the lower, to grasp prey which is then killed by constriction; after an animal has been grasped to restrain it, the python quickly wraps a number of coils around it. Death occurs primarily by cardiac arrest. 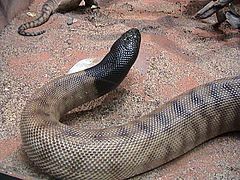 Larger specimens usually eat animals about the size of a house cat, but larger food items are known; some large Asian species have been known to take down adult deer, and the African rock python, Python sebae, has been known to eat antelope. In 2017, there was a recorded case of a human devoured by a python in Sulawesi, Indonesia. All prey is swallowed whole, and may take several days or even weeks to fully digest. Contrary to popular belief, even the larger species, such as the reticulated python, P. reticulatus, do not crush their prey to death; in fact, prey is not even noticeably deformed before it is swallowed. The speed with which the coils are applied is impressive and the force they exert may be significant, but death is caused by cardiac arrest. Pythons are oviparous, that is, they lay eggs. This sets them apart from the family Boidae (boas), most of which bear live young (ovoviviparous). After they lay their eggs, females typically incubate them until they hatch. This is achieved by causing the muscles to "shiver", which raises the temperature of the body to a certain degree, and thus that of the eggs. Keeping the eggs at a constant temperature is essential for healthy embryo development. During the incubation period, females do not eat and leave only to bask to raise their body temperature. Most species in this family are available in the exotic pet trade. However, caution must be exercised with the larger species, as they can be dangerous; rare cases of large specimens killing their owners have been documented. *) Not including the nominate subspecies. Obsolete classification schemes—such as that of Boulenger (1890)—place pythons in Pythoninae, a subfamily of the boa family, Boidae. However, despite a superficial resemblance to boas, pythons are more closely related to sunbeam snakes (Xenopeltis) and burrowing pythons (Loxocemus). ^ a b c d e McDiarmid RW, Campbell JA, Touré T. 1999. Snake Species of the World: A Taxonomic and Geographic Reference, vol. 1. Herpetologists' League. 511 pp. ISBN 1-893777-00-6 (series). ISBN 1-893777-01-4 (volume). ^ a b c d e "Pythonidae". Integrated Taxonomic Information System. Retrieved 13 April 2016. ^ "Huge, Freed Pet Pythons Invade Florida Everglades", National Geographic News. Accessed 16 September 2007. ^ Wang, Amy B. (29 March 2017). "An Indonesian man disappeared. Villagers found his body inside a 23-foot-long python". Washington Post. Retrieved 17 June 2018. ^ Selk, Avi (16 June 2018). "A woman went to check her corn — and was swallowed by a python". Washington Post. Retrieved 17 June 2018. ^ Hardy, David L (1994). "A re-evaluation of suffocation as the cause of death during constriction by snakes". Herpetological Review. 229: 45–47. ^ Boback, Scott M.; McCann, Katelyn J.; Wood, Kevin A.; McNeal, Patrick M.; Blankenship, Emmett L.; Zwemer, Charles F. (1 July 2015). "Snake constriction rapidly induces circulatory arrest in rats". Journal of Experimental Biology. 218 (14): 2279–2288. doi:10.1242/jeb.121384. PMID 26202779 – via jeb.biologists.org. ^ France-Presse, Agence (29 March 2017). "Giant python swallows Indonesian farmer whole". The Guardian – via www.theguardian.com. ^ "The Keeping of Large Pythons" at Anapsid. Accessed 16 September 2007. ^ Pyron, R. A.; Burbrink, F.; Wiens, J. J. (2013). "A phylogeny and revised classification of Squamata, including 4161 species of lizards and snakes". BMC Evolutionary Biology. 13: 93. doi:10.1186/1471-2148-13-93. PMC 3682911. PMID 23627680. ^ Reynolds, R. G.; Niemiller, M. L.; Revell, L. J. (2014). "Toward a Tree-of-Life for the boas and pythons: multilocus species-level phylogeny with unprecedented taxon sampling" (PDF). Molecular Phylogenetics and Evolution. 71: 201–213. doi:10.1016/j.ympev.2013.11.011. PMID 24315866. Wikimedia Commons has media related to Pythonidae. Pythonidae at the Reptarium.cz Reptile Database. Accessed 3 November 2008. Pythons (Pythonidae) at Answers.com. Accessed 3 November 2008.